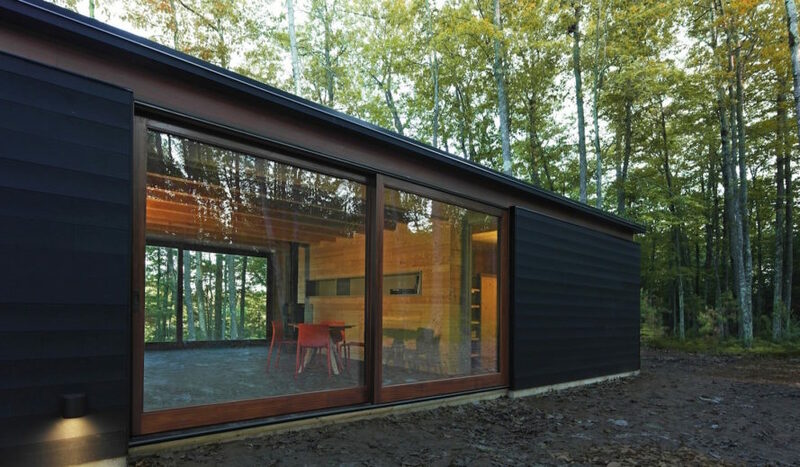 Deep in the woods of Wisconsin hides a handsome cabin with a deceptively simple design. Johnsen Schmaling Architects designed the Linear Cabin, a contemporary family retreat with precise detailing. Built from regionally sourced materials, the rectangular timber home sits on the landscape like a dark, fallen tree, combining elements of traditional Wisconsin cabin architecture with modern design. Located in St. Germain atop a steep bluff overlooking Alma Lake, the 900-square-foot Linear Cabin is accessed via a winding narrow gravel road that leads to a small clearing. The cabin sits at the threshold between the wooded plateau and the lake bluff. Blackened pine planks clad the exterior, while a strip of varnished cedar separates the black cladding from the thin roof plane. All of the timber used was sourced from Wisconsin’s northern forests. “With its simple plan, restrained use of materials, and precise detailing, the Linear Cabin continues Wisconsin’s rich legacy of cabin architecture – an unapologetically contemporary building that echoes the elegant clarity and rustic warmth of its typological predecessors but carefully avoids bucolic sentimentality,” write the architects. 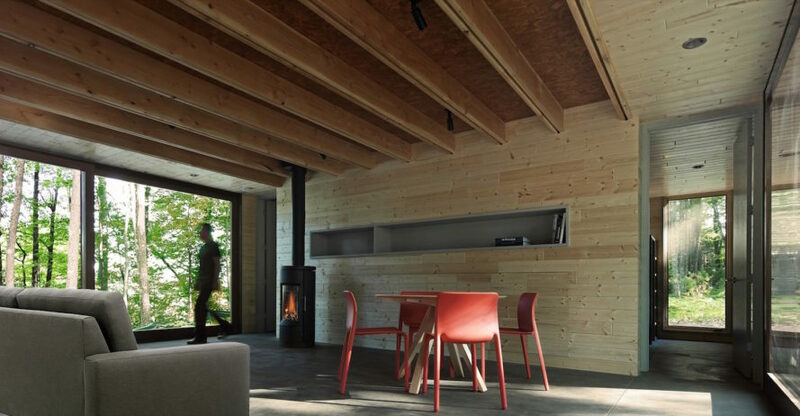 The cabin interior is separated into three identically sized boxes connected with glazed living areas that frame full-height views of the outdoors. The box-like areas include: a storage area for canoes, tools, and logging equipment; the service box that houses the cabin infrastructure such as entry, kitchen, bathroom, laundry, and boiler room; and the sleeping box with two bunk rooms. Knotty pine clads the walls and ceilings, and is complemented by a polished dark-grey concrete floor. Located in St. Germain atop a steep bluff overlooking Alma Lake, the 900-square-foot Linear Cabin is accessed via a winding narrow gravel road that leads to a small clearing. The cabin sits at the threshold between the wooded plateau and the lake bluff. Blackened pine planks clad the exterior, while a strip of varnished cedar separates the black cladding from the thin roof plane. All of the timber used was sourced from Wisconsin’s northern forests. The cabin interior is separated into three identically sized boxes connected with glazed living areas that frame full-height views of the outdoors.